As we get older birthdays seem to approach more quickly each year and I know many people say that they would rather not make a fuss over their birthday and would rather try and keep a low profile each year on the day that reminds them they have just turned another year older. If you look at it logically you are really only a day older than the day before your birthday so it is not all that bad! True to form another 2 birthdays, mine and Shaunagh’s held no hint of being low key as we arrived to scrapbook at The Memory Shed and each of our places held an assortment of beautifully wrapped presents and delicious food. Lisa, our ever creative teacher, soon coaxed us into the delightful task of unwrapping our treasures so that we had space to actually scrapbook and both Shaunagh and I were incredibly spoiled by an amazing group of women whom we work and laugh with each week. Thanks girls to you all for such beautiful and thoughtful gifts! 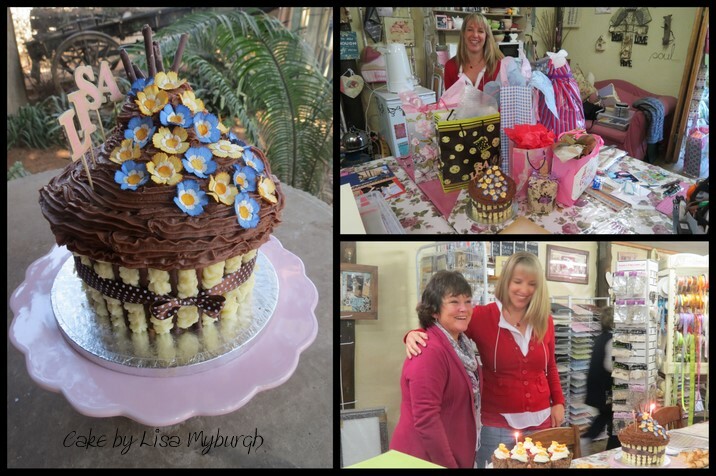 I had left home with many phone and facebook wishes from friends who said that hopefully someone else would bake for me on my special day and I am delighted to show you the beautiful giant cupcake that Lisa Myburgh made for me and had ready with all my gifts as I arrived into her shop.